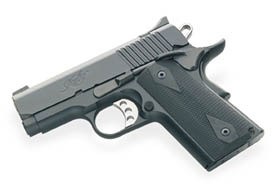 I am now the very satisfied owner of a new Kimber Ultra Carry .45. I am most pleased. I ran about 140 rounds through her yesterday to get the feel for it. The first shot at 12 yards was 6 in. low and 10 in. left. The next seven were in the bullseye–offhand. This was consistent for the rest of the rounds. I did start to flinch after about 50 rounds as my hands felt the recoil, but that will go away with more practice. Although I am new to the 1911 style, I am fast becoming a strong believer. If anyone ever asks, give the Ultra Carry a high recommendation.